obtaining the patent is equipped with the safety ring which can significantly ensure the safety. Panel removable system Patented technology easily removable panel system,The multi-configuration could be achieved without damage. 2. Colour: White, red, grey, blue, orange, wooden grain or other colour. 3. Electrical lines and water pipes. 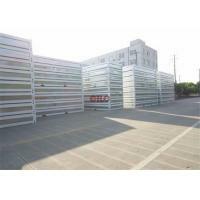 4. specification of sandwich panel. 5. Stair section, second floor corridor section and canopy. 6. We can provide solutions based on your design drawings.